This book deals with structural surveys for all types of building - domestic industrial and commercial - and includes diagnosis of a wide range of defects. It considers both modern and older construction methods, and deals with the particular problems of alterations and restoration work. Guidance is given on how to carry out measured surveys and on report writing. 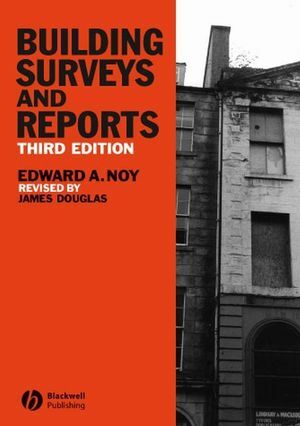 The third edition covers the latest definitions of types of property surveys, more information on report writing and a range of detail updates. Edward Noy trained as a building surveyor at Erith Technical College and in private practice, where he spent the early part of his career. He in building construction and materials at a technical college for some years, held a senior post in the Modernisation Division of the Greater London Council, and worked in private practice, surveying all types of property and advising clients on alterations, extensions and maintenance repairs. James Douglas is a Lecturer in Building Surveying at Heriot-Watt University, Edinburgh. He qualified as a chartered building surveyor in 1986 after over twelve years in the public, sector, dealing primary with the maintenance and adaptation of buildings. He has also had practical experience of inspecting and surveying buildings, particularly for dampness problems. He is co-reviser of Alan Oliver's book Dampness in Buildings and author of Building Adaptation. He is a member of the editorial board of the journal Structural Survey and a Visiting Lecturer in technology, teaching building technology and maintenance technology for the College of Estate Management. 1. General Principles and Responsibilities. 3. Measurement of Existing Buildings. 4. Surveys of Historic Buildings. 6. Defective Walls and Partitions Above Ground. 7. Reinforced Concrete, Cladding Materials and Structural Steelwork. 8. Damp Penetration and Condensation. 9. Timber Decay and Insect Attack. 10. Roof Structures and Coverings. 11. Fireplaces, Flues and Chimney Stacks. 12. Timber Upper Floors, Floor Coverings, Staircases and Ladders. 13. Finishes and Joinery Externally and Internally. 16. Fire and Flood Damage.